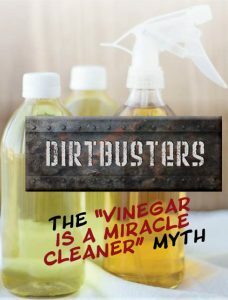 The myth that vinegar is a great all-purpose cleaner surfaced in the 1950s. People were using soap to clean everything, but soap left behind residue. This led to people using water to rinse off everything they had just cleaned. Somewhere down the line, it was determined that adding acid to the rinsing water got rid of the soapy residue, which left surfaces “squeaky clean.” Since vinegar is the most common acid found in homes, it became a natural practice to add vinegar to water. Most people didn’t understand the chemistry behind this process and concluded that since the soap residue was gone and their floors looked shiny and felt clean, vinegar must be the key. Vinegar is “natural,” and presumed “green,” but the terms are loosely defined. Natural vinegar does exist, but so does vinegar from synthetic sources, such as petroleum. Labels don’t always make this clear. It is also important to note that while vinegar does have disinfectant properties, there are not enough to classify it as a one. It would need to be 100x more effective to be considered a disinfectant. Since bottles of vinegar do not typically include safety or cleaning instructions, many concerns come with using it as a cleaner. Users might not realize that mixing vinegar with other cleaning products can be very dangerous because it has the potential to create chlorine gas. The product does have a Safety Data Sheet (SDS), but it warns that when using vinegar to clean large-scale areas, such as spraying down your shower, you should wear eye protection and a respirator. This is a pretty extreme way to clean. What are some examples of the damage vinegar can do? Hardwood Floors: Vinegar is acidic, meaning it is not safe for hardwood floors because it can dull or damage the finish. Many flooring manufacturers warn against it, and some say the use of vinegar will even void the warranty of the floor. Shine is not enhanced with this product, and constant use can make floors even duller. Carpet Odors: Nothing works better on a carpet stain than an enzymatic cleaner. Vinegar may mask the odor, but it cannot get rid of the source. To get rid of the problem, you need a designated carpet cleaner. For example, if you want to get rid of a pet urine stain, an enzymatic cleaner can help break down the stain so that pets won’t smell their mistake and repeat it in the same spot. Unsealed Grout: Vinegar can deteriorate the condition of your grout by weakening it, which will eventually cause it to etch or wear away. Disinfecting a Washing Machine/Use as Fabric Softener: While vinegar won’t harm your washing machine, it is virtually useless. Detergent neutralizes any ability the vinegar had, and the vinegar neutralizes the detergent, making it less effective at removing soil. You end up diluting vinegar so much that you do nothing – bad or good. Other unsafe areas of use include, but are not limited to: kitchen knives, egg-based stains, clothing irons, solid wood furniture, wax coated furniture, dishwashers, or pans. What about daily cleaning? While vinegar can help remove soap scum on acid resistant surfaces, that’s about it. This product can easily do more harm than good. Sometimes the damage occurs immediately, while other damage is only found over time. Vinegar may be a “natural” product, but many products are safer, greener, and do a better job of cleaning – even on the most delicate surfaces. A bonus? Your house won’t smell like a hoagie. Unless that’s something you’d prefer.